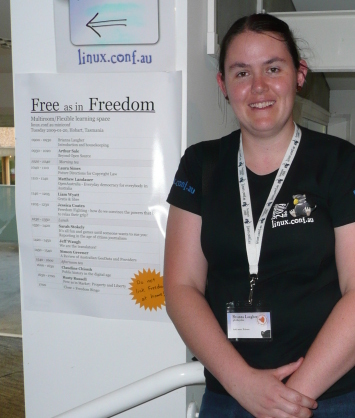 I should have mentioned this weeks ago, but: the call for papers for linux.conf.au 2010 is now open. And it closes this Friday in fact. LCA next year will be held January 18-23 in Wellington, New Zealand. LCA is a community-organised conference that treats its speakers well and is consequently one of the most competitive to get accepted into. It’s an awesome week and will definitely make a highlight on your geek calendar. One of the topics they “welcome proposals” on is: Free Software and Free Culture topics, including licencing and Free and Open approaches outside software. It’s harder to get into than OSCON. (Or so I’ve heard.) You will feel like a bona-fide superstar (at least until you see who the other speakers are). Educate the southern hemisphere about your awesome project and pick up some antipodean recruits. You get to meet free software leaders from across Australia and New Zealand with a healthy sprinkling of enlightened northern hemisphere attendees. Enjoy it all in New Zealand’s cultural capital. January is the height of winter in the northern hemisphere, right? The average high in Wellington in January is 19deg C (67deg F) which uh… actually doesn’t sound that warm to me for summer, but compared to a winter temp it probably would. So at LCA I was able to catch up with Michael Dale, who is doing some very interesting video work for the Wikimedia Foundation. Michael was talking about his development work, as well as taking part in the Foundations of Open Media Workshop which is collocated with LCA. There are two separate features that are bundled together in the demo: one is an in-browser video transcoder, and the other is a cool add-media wizard. The add-media wizard works on Firefox right now, while the video transcoder needs just a couple of extra steps, so I will cover the add-media wizard first. So if you click it, you will get a box coming up with some thumbnails of images, searching on whatever the name of the page you edited was. So what we get is some thumbnails from an image search, and we can see different tabs for different media archive sources. 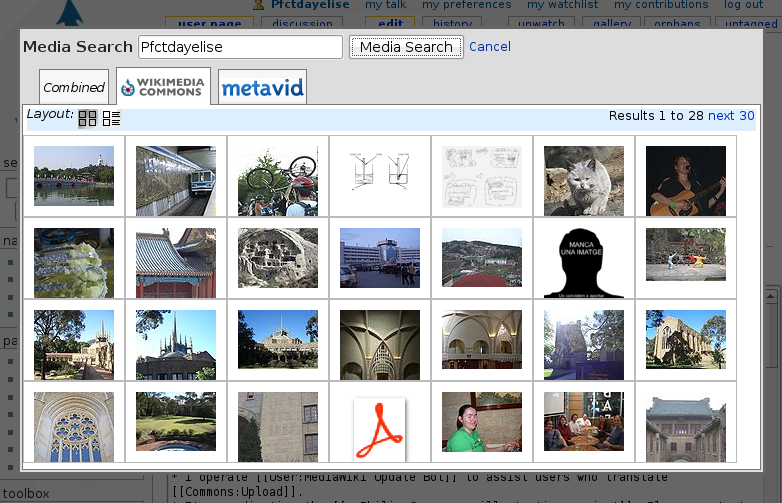 At the moment there is just Wikimedia Commons and Metavid. Obviously we could add other license-suitable archives as we become aware of them (eg Flickr’s CC-BY and CC-BY-SA images). Currently it mixes together all media types. Note the “preview” notice at the top of the drop box, and at the bottom the options “Do insert” or “Do more modification”. Hmm, so what was that crop option? Clicking on the “Crop image” option gives a “box drawing” cursor where we can draw a box over the image to choose what crap we want. Everything not in the crop is shadowed. So how does this crop actually work? At the moment, it relies on a template called Preview Crop. So if you’re testing this feature out, check that your wiki has that template. In the future, hopefully crop functionality could be added directly to the MediaWiki image syntax, so it might be equivalent to something like [[Image:Foo.jpg|crop,10,10,120,150|thumb]] or something. For now, you need the template. So that is the add-media wizard. If it is very well designed, it may remove the need to search Wikimedia Commons separately to writing your Wiki* article. (I mean, it wouldn’t be hard to improve on the default search.) It would be neat to integrate some of the features from Mayflower, including hover-over indication of license, description and metadata, and advanced search options such as searching by file type. Currently, as I understand it, Wikimedia Commons is kinda “hard coded” into the wizard. For Wikimedia wikis that makes sense, but this could be used by any MediaWiki and also take advantage of any specified foreign API repo. Possibly wikis could specify which images should not be indexed by listing deletion templates somewhere, but OTOH, if the description info is displayed, I guess the user can figure that out for themselves. If you search in a non-Wikimedia resource and insert a file from one, the wizard will transparently copy the file to the local wiki (along with any appropriate metadata it can get I suppose). Depending on which third party archives get added, I guess the Wikimedia Commons community will like to have some say about how that copied info is formatted. That’s about it for now; I will cover the in-browser video transcoder in a second post. If you think it looks interesting I encourage you to try it out, and report any problems or suggestions you have. Or if you have no problems: that’s also good to know! If a few more people try it out in its current form, I think it would be a great thing to enable as a Gadget then people can easily choose to use it by turning it on in their preferences. Ultimately it may even be best as a default thing turned on for everyone, by being integrated into MediaWiki core. LCA Free as in Freedom miniconf three days away! I owe Packt Publishing a book review. 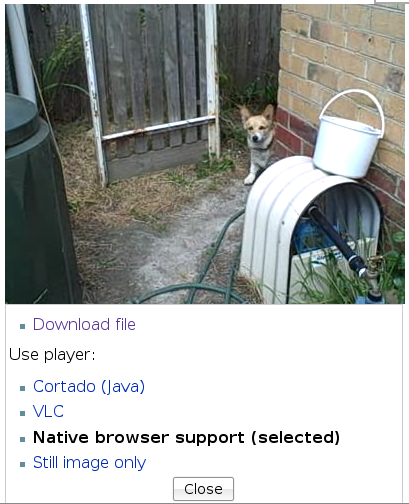 I thought I would review their MediaWiki skins book by trying to use it to create a skin. But that wasn’t very smart because it’s still a substantial amount of time and faffing around making CSS work as intended and such. So I tried to say I wouldn’t post until I wrote that review, but that hasn’t quite worked, because now LCA is next week. So I will put my self-imposed posting boycott on hold until LCA is over, and then hopefully write my bloody review. Setting up for Open Day. Well, Saturday was the last part of LCA – Open Day. 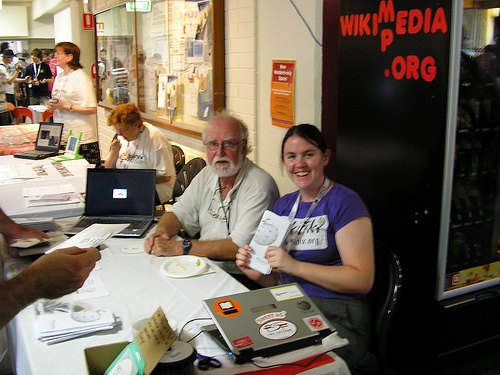 I had a table on Wiki[mp]edia with Brian who kindly volunteered to help me out. We gave out around 90 of each of these things, and over 120 of the leaflets. 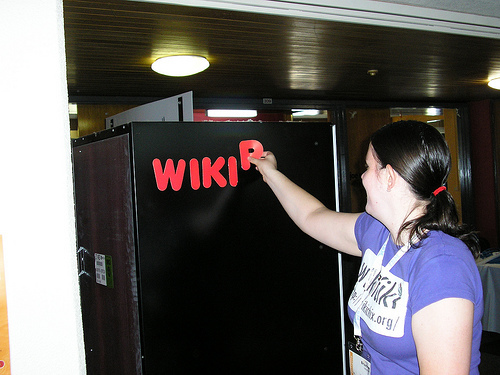 We also sold around 80-90 of DVDs containing the 2007 Wikimedia Commons Picture of the Year zip, which added up to about 1.2G of data. I should have put the 2006 archive on them too. Too late now… Anyway we sold these for $1.50, as that is what getting the discs made cost me. I will more or less get completely reimbursed for the free stuff. Brian brought his laptop and had a slideshow of the images on the disc running, which worked very well. I had my laptop open with Wikipedia on it. Talking to people was interesting. Lots of people said “I love Wikipedia, I use it all the time” to which I would immediately reply, “Have you ever edited it?” Two people said back, “I would, but I’ve never found anything wrong to correct”. That’s really interesting; not long ago, I would never expect that response. A couple of people had edited Wikipedia and had some anecdote to share. They got to a point where they wanted to do something and weren’t sure what to do or how to find it out, so they left it. So it was nice that Brian and I could answer some questions. Another was about missing entries on languages spoken in Indonesia. With that, I said to the guy, “Hey, let’s start the articles right now,” and so we did. :) (Because he doesn’t have an account, this way he can edit them – you need an account to start a new article, but not to edit it.) I hope he does go and improve them now. That will be cool. Paul, who took this photo, talked me into giving a lightning talk on Wikipedia. This is a talk with a three minute time limit. 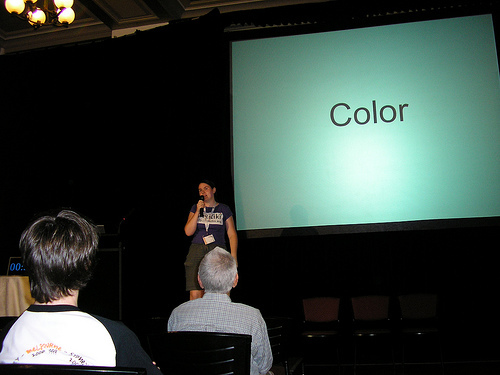 I gave an example of an edit war via slides – color/colour/color/colour/color/colour/color/colour/color. This is nice; Australians understand how this would be a unresolvable conflict. :)At the end I gave a plug for Wikimedia Australia. The workshop idea was influenced by talking to Dutch Wikipedian Ciell, who has been travelling in Australia and with whom I had dinner last Tuesday. However the tyranny of distance may still be too great for it to work here. I am not sure the community is actually large enough yet. Today, Friday, was the last day of the LCA programme. Tomorrow is the Open Day which is the “real” last day I suppose. I stayed up too late last night and consequently slept in this morning, missing the keynote on Python. Grr! However I reasoned that the keynotes have a much higher certainty than normal for actually getting video to appear at some stage, so I think it will be OK.
Seeking is hard: Ogg design internals (note slides (PDF), video (Ogg)!) Very technical; well-presented. Stop in the name of law, or rather, “don’t stop”, since her message was more or less “just keep coding”. Notes at the end. None of session 3 seemed that interesting to me, so I went to FOSS for geospatial BoF. I was fairly out of my depth, it’s safe to say. :) I have merely idle curiosity, where as these guys were all pretty serious about it. They are setting up a chapter of OSGeo (Open Source Geospatial Foundation). Designing library APIs: How to make users love your library. While I’m sure the presenter has a wealth of experience in creating APIs, it seemed like he had trouble managing to get this information out, and it ended up being extremely general, which is less practically useful. And LCA 2009 will be held in Tassie. Very good! Then there was sitting around for ages waiting for the “Google party” to kick in, which was in fact the “Google barbie”, not party. It was OK.
DRM is dead? Probably not – although the music industry is moving away from it, DVDs and pay TV will probably still use it. Software patents — too hard to kill now? Lots of investment in them – ~25,000 in 2004. Mentioned some org MIPIA? MIBIA? in Australia, I think like RIAA or MPAA????? Thursday was the second day of LCA proper. Memory-efficient and fast websites – pick two! – REALLY good! Recommended if you run some hobbyist websites. The slides are not that enlightening so best wait for the audio or video. 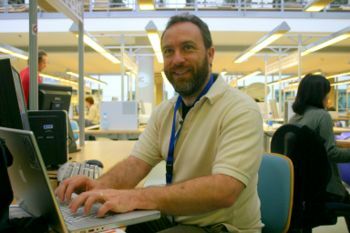 By Sound and By Touch: Using Linux with Speech and Braille Output Interfaces – interesting and useful, quite technical. No slides, so wait for audio/video. An introduction to open source animation – Elizabeth Garbee is only 15, holy crapoli. Her talk was impressive, hugely interesting and very confidently presented. And this is actually her second LCA!! Just amazing. Reminder to self: don’t forget to check out l10n and Parrot. Big rec for today would be “Memory-efficient and fast websites – pick two”. Afterwards I got talking to the guy next to me who does some Django development, since I am planning to try and learn that sometime this year. 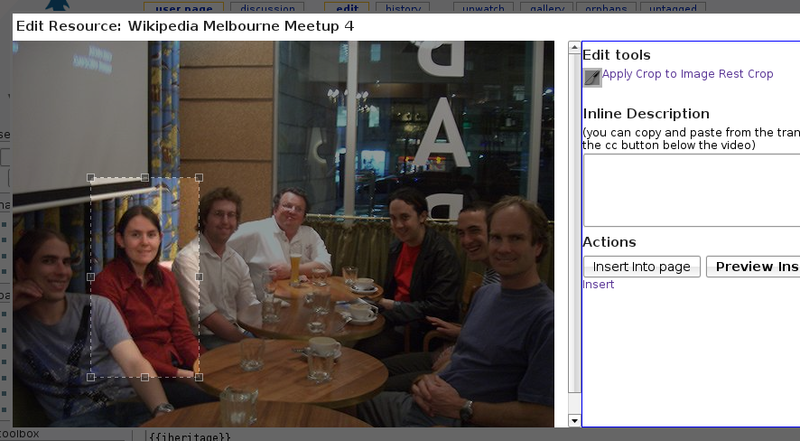 Also, my laptop is so noisy that running it during a talk made all the people next to me look at me :( Definite FAIL. I forgot to mention yesterday the surprise that they gave out about a dozen OLPC laptops to conference attendees, I think there was some small proviso that they had to use them and report back about certain things. OLPC has quite a presence here. Apparently they are trying to get some into Australian primary schools? Not sure about the details. The ultra mini Asus Ee(e?) PCs are also a big hit here. It’s interesting how simple constraints seem to create new opportunities and new markets. Less is more! I also wonder a little bit why OLPC appear to be trying so hard to win us over. I think we are already won over. We being open source geeks. Wednesday was the first day of the main conference. Note how slides and video recordings have already started appearing, and the conference isn’t even over yet! All conference organisers ever, this is how to it oughtta be done! And then for the “penguin dinner” instead of something formal we all went to the Night Market at Queen Vic Markets and they gave us little vouchers for food. It was a pretty cool idea, well-executed and I can imagine most attendees felt more comfortable there than at a formal sit-down dinner. And I found a third Wiki*edian, besides me and Nick. :) Isaac from a previous Melbourne meetup. 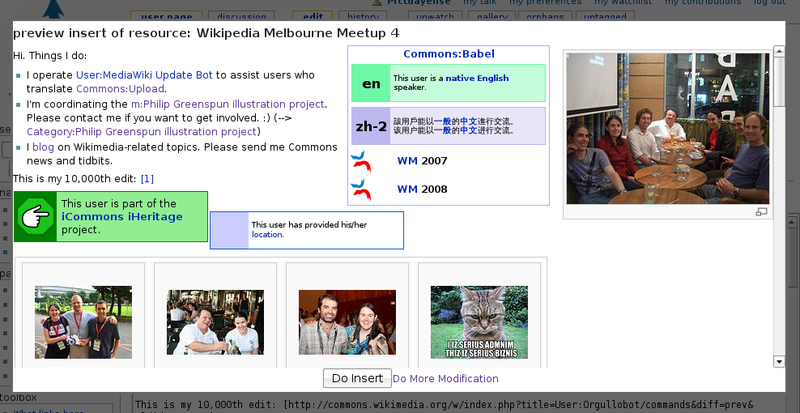 CC is useful for Wikimedia up to a certain point, and it is in both our interests to push up to that point. On the way out after the OLPC talk I ran into one of my old lecturers who had snuck in to see it. :) We talked for a few minutes as the conference attendees streamed out to afternoon tea. He commented on his surprise at seeing so few suits-types — it’s basically all just people in t-shirts and shorts — and asked if I noticed how male-dominated it was. He guessed it was less than 10%, maybe 5% female. I’m not sure on the official stats. At the first morning tea, I really noticed it (especially after leading the LinuxChix miniconf which was maybe 1/2 to 2/3 women). It was just really…whoa…. there are so many guys here. Way, way more compared to my maths classes, my compsci classes, my cycling events, and my (one) Wikimania conferences. So I don’t really have a point to make about this, except for the first time I did feel really, REALLY outnumbered. Because let’s face it, you could learn much more from a man page than from a typical conference talk, so saying you’re just here for the “technical” is a bit of non-sequitor in my book. Perhaps I was a bit more blunt than I intended, because he got up and left about ten seconds after that. But I am not sure I have much further conversation to have with someone so blatantly anti-social, so perhaps it was no bad thing. Apparently a Flickr image of mine has been used in something called Schmap!! Melbourne. It’s like Google maps + Flickr geotagged images + tourist writeups. 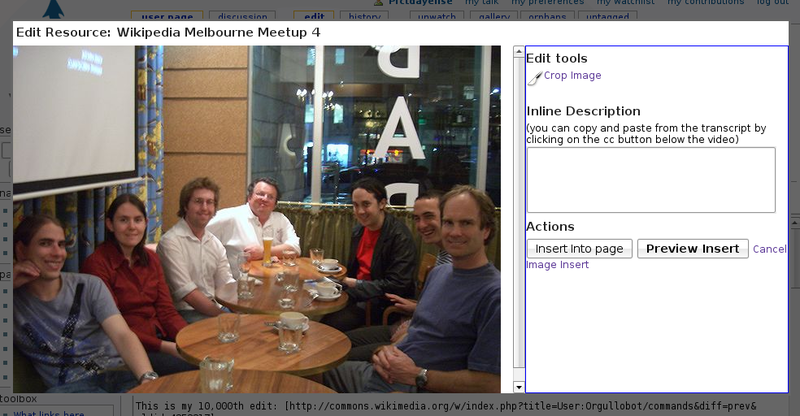 It’s not a particularly interesting or good image, but it does have half the word “Melbourne” in it. That counts for something I suppose. Audiophile, an “audio portal/listening library”, was announced a few weeks ago, and is looking for contributors, especially “young and emerging producers”. Their default license is CC-BY-NC-SA. Sigh. Randy Wilson wrote an interesting round-up of Wikijunior, a project within Wikibooks to create children’s books. Their work is different to most Wikimedia projects, in that their intended audience would not be the ones writing the material. 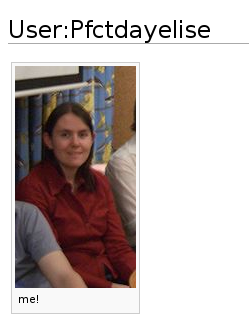 My submission for LCA’s LinuxChix miniconf, “Who’s Behind Wikipedia?”, was accepted. That will be January 29th, 2008. The idea for it came about when I went to the Freebase meetup and we ended up talking about people’s experiences editing Wikipedia. The good thing is that the audience is geeks, so I won’t have to explain the FLOSS/free-content ethos, or “what is a wiki”, or even “what is Wikipedia”. Likely many geeks have edited Wikipedia at some time, even if it’s just correcting typos. But unless you follow it all closely I imagine it can be difficult to tell what’s consensus and what’s cabal. :) And there are likely to be the odd few that, as Wikipedia Weekly say, “know their RfA from their AfD”, so that will keep me on my toes. 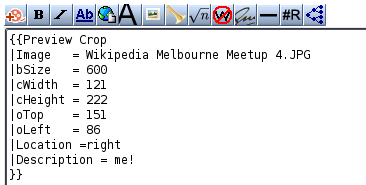 Maybe in the future we could be organised enough to hold a wiki/freecontent miniconf. The Wikimedia Foundation has officially announced their approval of a substantial donation by Mr Greenspun for the specific purpose of funding the creation of illustrations. This is the first time the Foundation has been involved in funding content creation, although related groups like the German chapter have held similar kinds of projects. I’m going to be co-ordinating the project, which is both exciting and scary. If it goes well, it will likely open the door to future “targeted donations” and content creation projects. If it goes well, it will get new people involved in a really global SVG editing community that is open, growing and self-supporting. If it goes well, complex and fundamental topics will gain world-class illustrations to rival any “visual dictionary” or “children’s encyclopedia” and the like. What’s more, those illustrations will be able to be translated with nothing more than a text editor. And they will be free to the world to use however they like. There are two ways it could go poorly. One way is due to lack of interest, which would be disappointing but not disastrous. The other way is spectacular failure, where the introduction of money into a previously volunteer-only cycle reduces or ruins the motivation of those contributors. It will be careful path to walk, but we’ll never know if we don’t try.